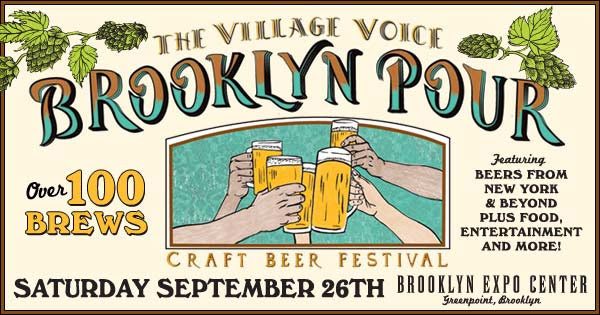 The Village Voice’s 5th Annual Brooklyn Pour craft beer festival returns Saturday, September 26th. The event will be held in Greenpoint, Brooklyn at the Brooklyn Expo Center from and will feature over 100 craft brews from New York and beyond. There’s food, entertainment, and more. Pre-sale tickets are currently available now through Tuesday, July 28th at 10:00AM. General public tickets go on sale on Tuesday, July 28th at 12:00PM. This year’s Brooklyn Pour will feature three tiers of ticket options. All ticketholders will be offered unlimited tasting of 100+ beers, a souvenir tasting glass, entertainment, and an exclusive Brooklyn Pour photo booth. The VIP ticket will allow guests entry one full hour early at 2:00PM, plus access to the private VIP lounge with a private bar, complimentary snacks, and a VIP Gift Bag. The Early Entry ticket will allow guests entry into the main room of the event a full half hour earlier at 2:30PM. The General Admission ticket allows entrance to the event at 3:00PM until the event finishes for all ticketholders at 6PM.